The prime minister began his 30-minute speech with the slogan “Jai Bhim” and “Bharat Mata ki Jai”. Modi also reached out to the Dalit voters by referring to Ambedkar. 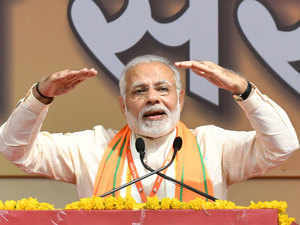 ALIGARH: From Bharat Mata ki Jai to the surgical strike and the Balakot air strike, PM Modi invoked nationalist sentiments throughout his election speech here to woo voters from the Lok Sabha constituencies of Aligarh, Hathras and Bulandshahr at a joint rally for the three seats. Modi also raised the “Jai Bhim” slogan and praised Bhimrao Ambedkar, hailing him as the architect of the Indian Constitution, on his birth anniversary. He asked the sizable crowd, comprising mainly of youngsters from the three Lok Sabha seats, not to fall into the trap of the SP-BSP-RLD alliance, which wants them to vote on caste lines. “You are shouting Bharat Mata ki Jai with such enthusiasm but in our country there are some who have a problem in saying it. To give them a befitting reply, raise your clenched fists and say with me Bharat Mata ki Jai,” Modi said. Though Modi devoted a significant part of his speech to slam SP-BSPRLD on caste politics and how the first priority should be development, the crowd was energised each time he mentioned national security. “Terrorism should be finished or not? Should one enter their territory and kill Pakistani terrorists or not? Should surgical and air strikes be carried out or not? Should our brave soldiers be given a free hand or not? Did your chowkidar do the right thing or not? But they (opponents) say Modi should go. Will that be good for the country?” he said. He maintained that trust in him and BJP is due to the development work done in the last five years, adding that his mission is to end terrorism, corruption, disease and poverty. “With your support, this chowkidar has made an effort to tread on the path shown by Ambedkar. I have run the government with ‘sabka saath, sabka vikas’,” he said, adding that all have benefitted from welfare schemes like Ujjwala, PM Awas Yojana, and Saubhagya. The prime minister also underlined that his government has given due respect to Ambedkar and development of five places associated with him as “pilgrimage centres.” He said the height attained by Ambedkar — a great economist, policymaker, writer and legal expert — was extraordinary and unprecedented. “It is the strength of Babasaheb’s Constitution that today a person who emerged from the deprived, exploited society is occupying the post of President. A person from the rural and agricultural family is vice president and a chaiwala is the prime minister of the country,” Modi said.